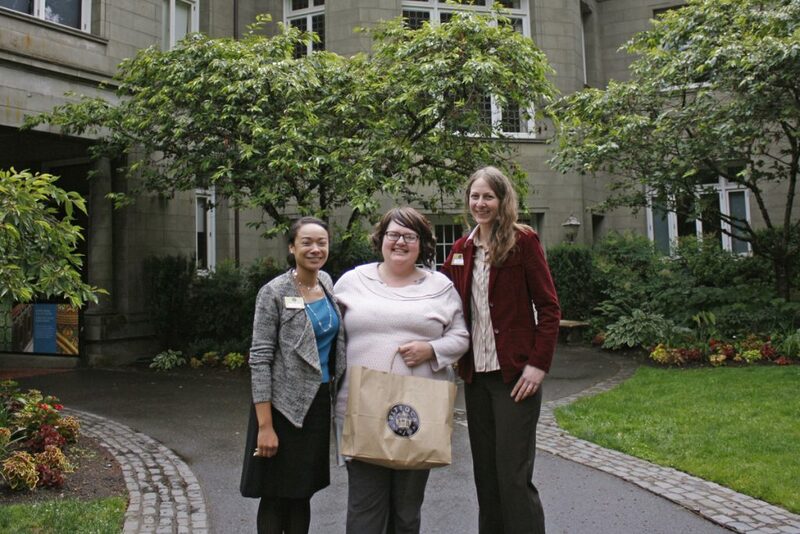 Our 100,000th visitor with Pittock Mansion Executive Director Marta Bones and Associate Director Jennifer Gritt. On June 23rd, 2016, Pittock Mansion welcomed its 100,000th visitor in the last 12 months! At a time when many historic house museums around the country are experiencing declining visitation, Pittock Mansion’s annual visitation has steadily grown from 81,000 visitors in fiscal year 2013/2014, to 86,000 in fiscal year 2014/2015, to a new record of 100,000 visitors in fiscal year 2015/2016. Our 100,000th visitor was new Gresham resident, Mya. Mya and her family recently relocated to the Portland area from California. Her first-time visit to the Pittock was inspired by an unexpected afternoon off and the Pittock Mansion signs on Burnside. “Pittock Mansion, that sounded interesting!” Mya explained. A regular museum goer, Mya has visited museums in New York, California, and Chicago, and found the accessibility of Pittock Mansion to be unique. “Everyone is very friendly and welcoming, and the signs were informal and interesting,” Mya said. Mya’s favorite spot in the mansion was the Sewing Room due to her interest in knitting and cross stitching. In celebration of setting Pittock Mansion’s new visitation record, staff presented Mya with a gift bag including a free Family membership, 4 complimentary admission passes, and a Pittock tote, mug, and magnet. We look forward to welcoming Mya and her family, new Oregon residents into the Pittock Mansion community and the Portland community at large. Pittock Mansion’s record attendance comes as Board and staff prepare to initiate a new four-year strategic plan which will further enhance the visitor experience, expand educational programming, and increase community engagement. “Reaching 100,000 annual visitors is an exciting milestone in the Pittock’s history,” Executive Director Marta Bones stated. “I can’t think of a more appropriate way to launch our work on additional strategic improvements to support an engaging and educational experience for our visitors.” In addition to further enhancing public program offerings, the mansion will work with Portland Parks and Recreation to improve access and create a sustainable long-term preservation plan for the buildings. The new strategic plan will build upon the successes of the Pittock’s Visitor Experience Project, which surveyed visitors about their needs and interests. Focusing on these, the museum positioned itself to fulfill its mission of inspiring understanding of Portland history in ways that would be compelling and relevant to visitors.